in terms of possible delay and uncertainties in Apps publication. After the new Google policy to restrict functionality of third party apps using call-log / SMS permissions is in force since March 2019, Google only permits Apps with specific “core functionalities” to access those permissions on Google Play. 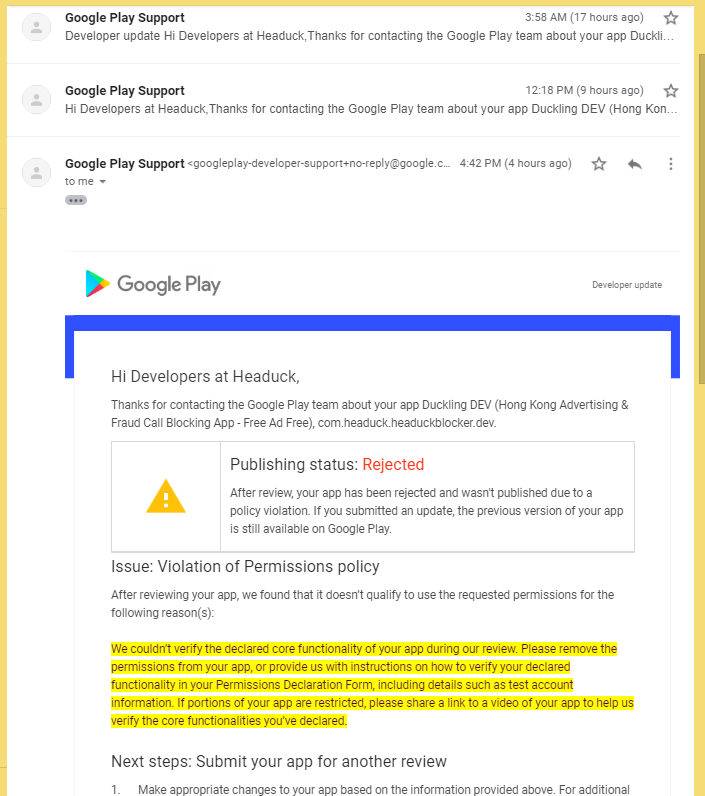 The “core functionality” in this case is call blocking, which has previously been verified by the Google Play Support team for the previous version of the App in question. These rejections were received minutes after re-submitting App updates (and thus likely made by bots), and continued even after testing instructions and Youtube videos were provided in declarations. Seems that in future updates, there will be extra efforts / delays to convince the Robot-In-Charge that the developer has not removed the core functionality of an App in updates (which I cannot think of a sane reason for doing so).